Sampling the best of Buchan at Fraserburgh Super Saturdays, sleeping in a Hobbit House at Down on the Farm Glamping in Rosehearty plus a visit to Kinnaird Head Lighthouse. I spent my childhood on a farm in The Back Isle only moving to Aberdeenshire when I went to University. Prior to that I made an annual pilgrimage to the area during the Easter holidays. 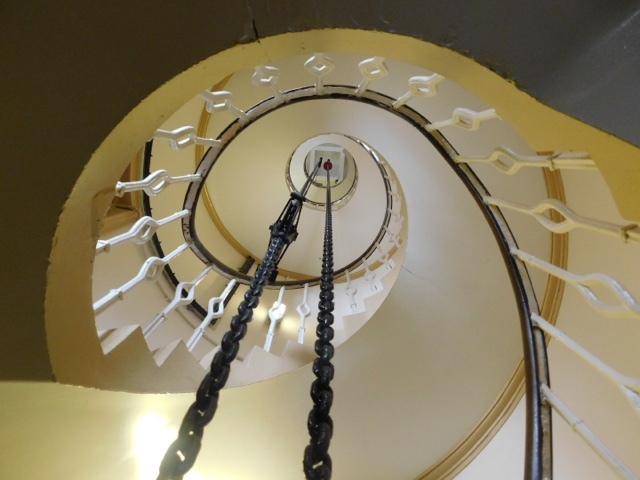 Firstly to Aberdeen and latterly to Frasebrugh. My Mum's Aunt, Aunty Meg lived in Don Street in Aberdeen before moving to Scalloway Park in The Broch (the local name for Fraserburgh) and then to sheltered housing in Cross Street. My Mum along with my sister and I used to stay with her for a week each Easter. I remember those holidays as always being warm and sunny. There are certainly a selection of photos taken by my Mum on her Kodak Instamatic that would back that up. Happy days spent on the beach, eating ice creams, burying each other in the sand and riding ponies. All those nostalgic memories came to mind when I was contacted by Fraserburgh Super Saturdays and asked if I'd like to join them for their inaugural 2017 event and spend the weekend sampling the best of Buchan. How could I refuse? Our weekend kicked off at Saplinbae Hotel near Mintlaw, but I'm going to save those adventures for a separate blog post so watch this space. Suffice to say we enjoyed fantastic hospitality and wonderful food which showcased the best local produce from the area. With full bellies from a substantial Buchan Breakfast we headed to the Broch for Super Saturday - Fraserburgh Celebrates. Organised by Fraserburgh Development Trust, Super Saturdays are family friendly themed community events celebrating all that is great about Fraserburgh. They take place in the town centre and feature a huge variety of stalls, entertainment, food and fun. We had a quick look around to get our bearings before it was time for the kids fancy dress competition which I was judging. Great effort from all (including one adult - you know who you are!) but there could only be one winner. Congratulations to the Broch Dragon! The event had plenty to keep the kids entertained with bouncy castles and the likes and the main attraction being a fee show from Artie's Tartan Tales which by all accounts went down a storm. My daughter's eyes popped out of her head when she spotted a Nutella Calzone at Basic Kneads. Theirs did likewise when she removed her jacket to reveal a Nutella hoodie!!! A match made in heaven. Time to properly explore the stalls and find out more about what Super Saturdays is all about. 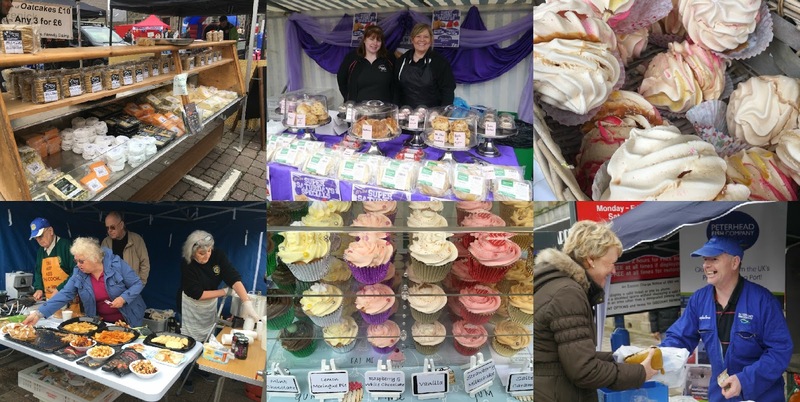 There was a great turnout of local suppliers selling everything from cupcakes and cheese to preserves and pies, fudge and fish. In addition to the food, there was also a really good selection of craft, charity and community stalls, over 40 in all. On top of the foodie goodies to take home there were also plenty of options to eat there and then. We enjoyed Paella, Pizza, Burgers, Coffee and Ice Cream. As well as a DJ, entertainment was provided from local drama, dance and singing groups - plus visitors from a galaxy far, far away... Myself and my daughter got roped in to trying out the belly dancing with the fantastic Tribal Mutiny. It is really hard work, but I'd totally be signing up for their classes if I lived closer. Such good fun! The local Rotary club did a sterling job manning the tasting gazebo dishing out samples from local shops and producers and cooking up tasters of wonderful fish dishes. We tried fish soup, Arbroath smokie risotto and fish fingers. All were amazing! I headed over to the fish stall to buy some Smokies and recreate the risotto but someone had clearly had the same idea and he'd just sold the last pair! 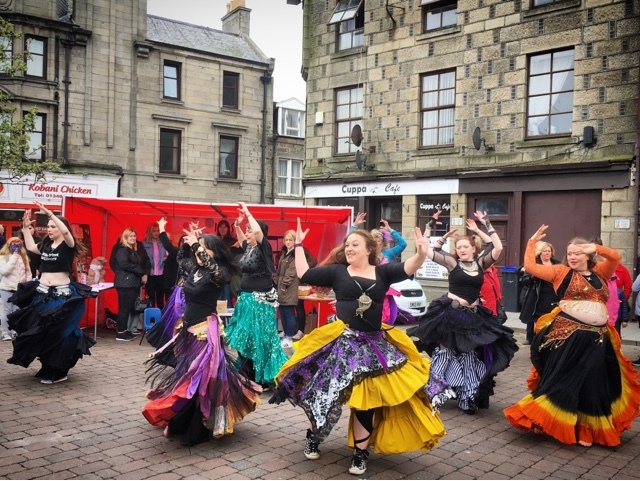 Super Saturdays is a great joint initiative from the local community, Aberdeenshire Council and Fraserburgh Development Trust to bring folk into the town centre. It's a challenge that many market towns face these days and it seems that local business in the Broch have also come on board as many were offering Super Saturday discounts and offers. The increased footfall in the area clearly means better trade for all so its a win win situation. Their ambitious plans for an Ice Rink at the December event are to be applauded and supported. 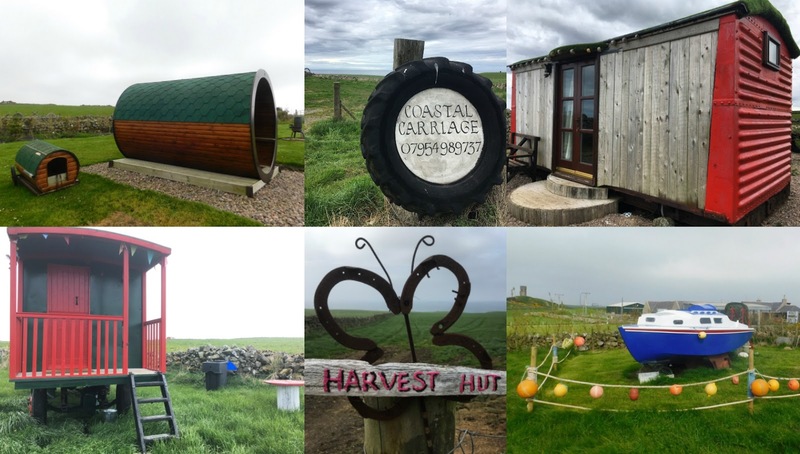 Our Saturday night accommodation was in the 4 Bed High Seas Hobbit House at Down on the Farm in Rosehearty, 4 miles west of Fraserburgh. This was actually our third visit having stayed there in March 2013 and again in July 2013. Since our last stay there has been the addition of a 2 bed hobbit, a coastal carriage, a harvest hut and a 'teas and seas' tea room. 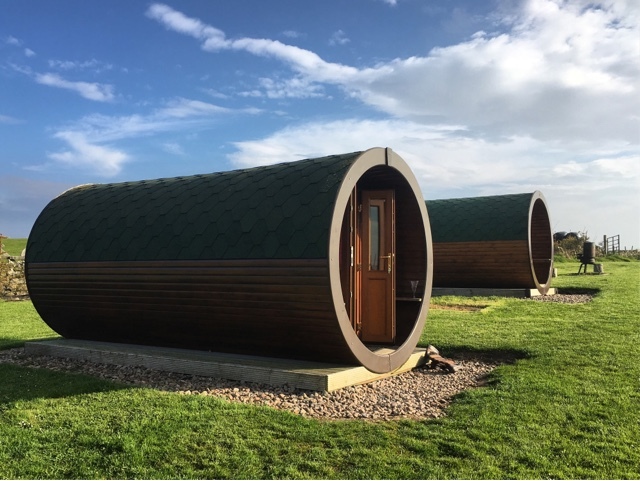 Rosehearty is clearly Aberdeenshire's Glamping capital! We were welcomed by a fantastic hamper of produce from local suppliers. Bakery goods from Murdoch Allan and Websters Bakery, Eggs from Aberdeenshire Choice and Meats and Pies from I.J.McIntosh Butcher. What an absolute feast! 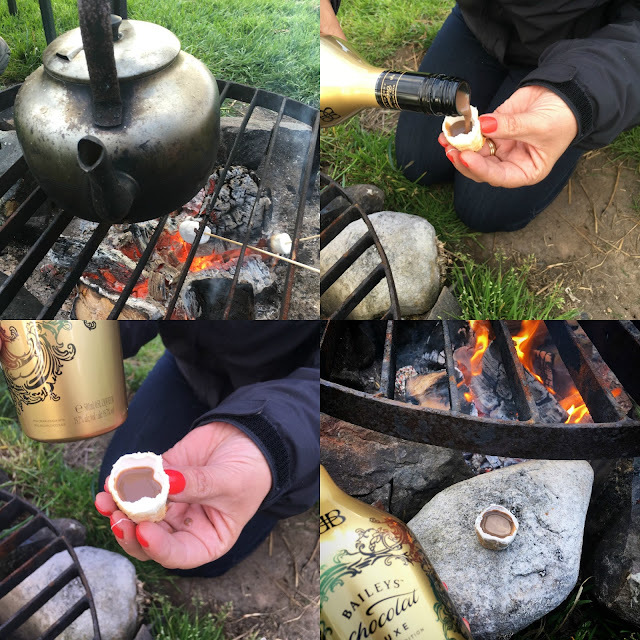 We managed to fit in a couple of local Geocaches before returning to base camp to get a fire going and cook up some of our treats. 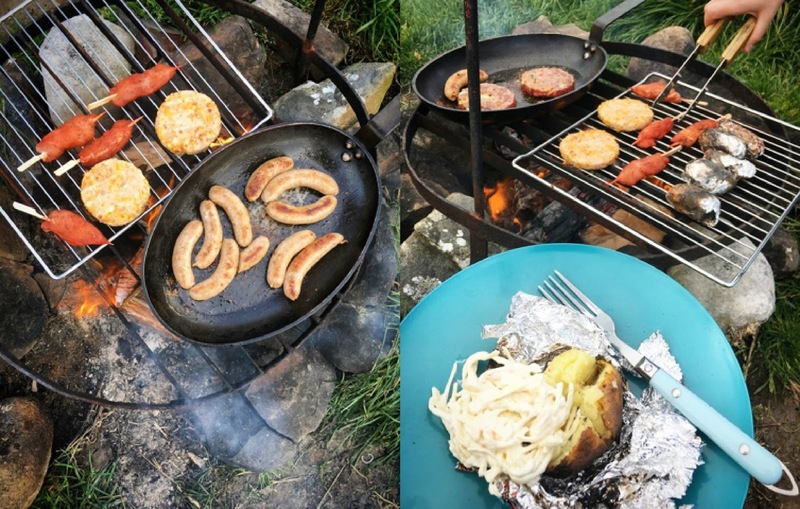 New potatoes were wrapped in tinfoil and popped into the side of the fire to bake whilst we fried up sausages, burgers and kebabs. Picky Girl declared the Chicken and Mealie Burgers the best ever, I was smitten by the coleslaw and suffice to say that the Prime Steak, Cheese and Spring Onion burgers are deserving of their 'Best Burger in Scotland' accolade. Dessert was in cake form with a huge caramel topped and cream filled sponge from Websters Bakers for the little kids and Baileys Marshmallow Shots for the big kids. The Baileys Marshmallow Shots caused a bit of a stir on my social media. Here's how to make them if you fancy giving them a try at your next BBQ or campfire. For the ultimate Glamping Tipple... Carefully toast a marshmallow (the bigger the better!) allow to cool slightly then gently remove the outside layer to create an edible glass. Time to retire for the night in our cosy Hobbit House. If anything we were too cosy and certainly didn't need to use the fan heater. The Hobbit comes with all mod cons. Electricity, fridge, microwave and kettle plus crockery and cutlery. Outside there's a cupboard stocked with pots and pans, cooking utensils and everything you'll need to get a campfire burning. The 'facilities' are by means of an award winning Loo in a Whisky Barrel and there's even a shower. All you need to bring are sleeping bags, pillows, towels and a sense of adventure. A long lie in on Sunday morning saw breakfast turn into brunch, and what a brunch it was! 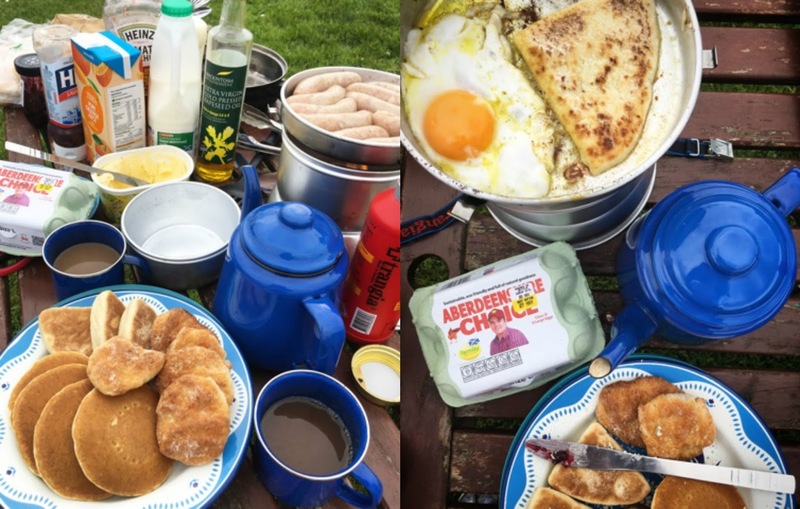 Sausages, tattie scones and fried eggs fae Strichen! There may even have been a cheeky burger. We all particularly loved the Mini Butteries from Murdoch Allan and I was delighted to see 'Mini Plate Scones'. These were a smaller version of what I remember my Grandma Corntown making which she called Girdle Scones. Time for a few more Geocaches on the road back to the Broch before a visit to Kinnaird Head Lighthouse. 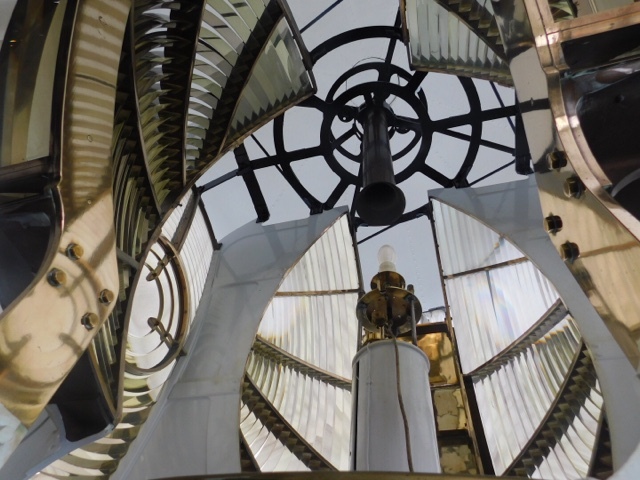 We'd missed the start of a tour up the lighthouse by 10 minutes so headed off to explore the museum which tells the tale not only of this particular lighthouse but that of the Northern Lighthouse Board, the engineers who built the lights and the keepers who tended them. 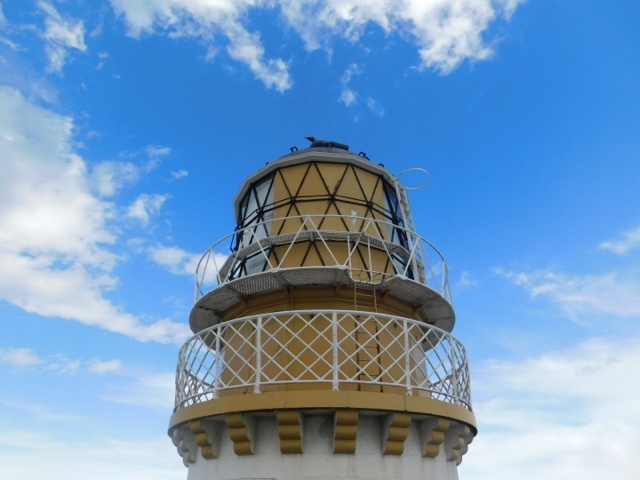 I've always been fascinated by lighthouses - I blame Blue Peter who seemed to regularly visit them - and we've actually stayed in one of the cottages at Buchan Ness Lighthouse just a wee bit further south down the coast in Boddam. The museum gave a fantastic insight into the skill, courage and technical genius required to establish and keep the lights flashing. Disclosure: We were invited to Buchan as guests of Fraserburgh Super Saturdays. Thanks to Down On The Farm and The Museum of Scottish Lighthouses for their hospitality and to Murdoch Allan, Websters Bakery, Aberdeenshire Choice and I.J.McIntosh Butcher for our dinner and breakfast. Thanks to John Alexander Johnston for additional photography. Like actiona pacled post! yeah I would go nuts for a Nutella Calzone. 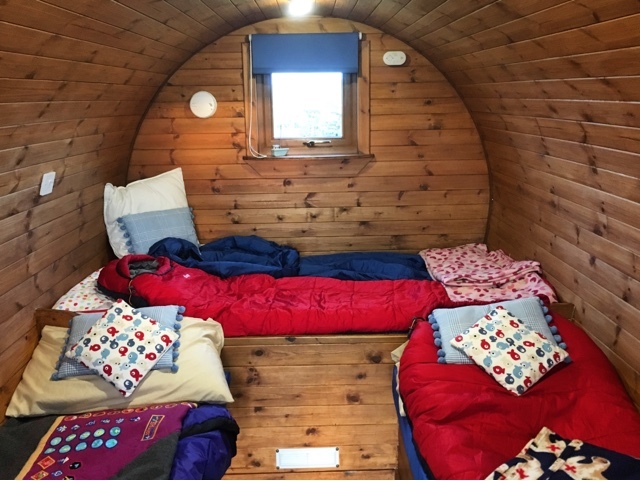 The term Glamping is so funny lol and wow on the hobbit home, gald to see the inside of it too. That marshmallow shooter awesome! I'm not much of a glamper, but I'd be totally into trying this experience. Plus - how cool to say that you've slept in a hobbit house.